“That’s where people spend their time,” said Jeremy Greenberg founder of web design and digital marketing agency 97 Switch. 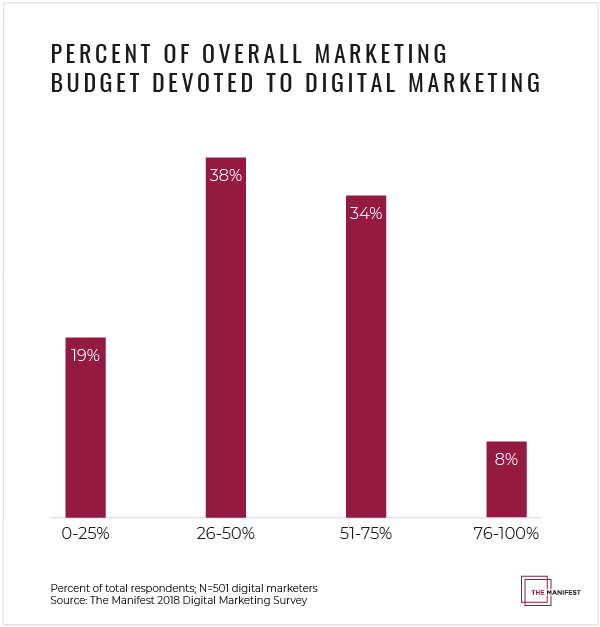 A recent survey by The Manifest of 501 digital marketers from businesses across the U.S. with more than 100 employees found that virtually all – some 99 percent – plan to increase their investment in at least one digital marketing channel in the next year. Around two-fifths of these businesses – 41 percent – are already investing more than $500,000 in digital marketing every year. The digital marketing channel that is expected to see the largest growth is social media marketing. Nearly two-thirds of businesses (64 percent) plan to spend more money on social media in the coming year, according to the survey. Social media platforms such as Facebook, Instagram, LinkedIn and Twitter “can be used to build a community of engaged users,” said Aylin Cook, head of content marketing at digital marketing agency Single Grain. Clothing retailers, for example, can encourage customers to post photographs of themselves on Facebook or Instagram wearing items they purchased. Pink Lily Boutique, a women’s fashion retailer, built a 250,000-person Instagram following by offering photo contests and gift card giveaways, featuring customers’ photos on their site and regularly seeking feedback from followers. 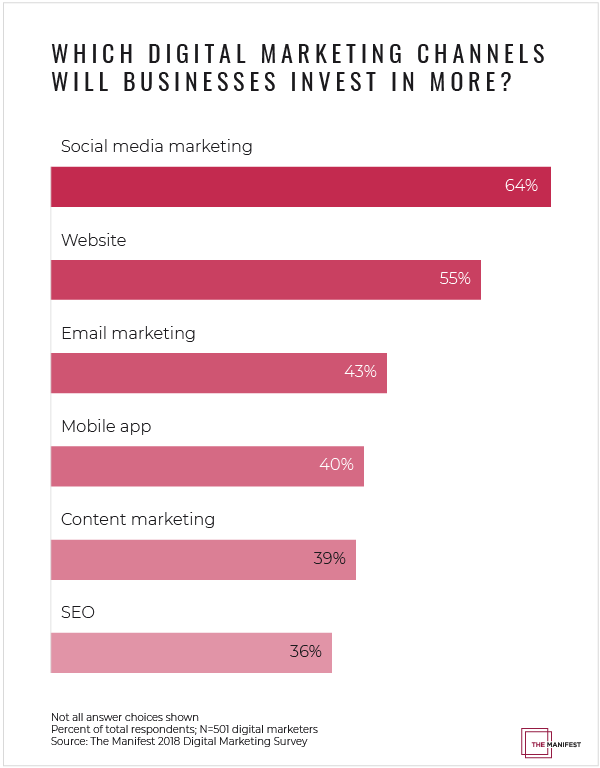 Businesses see investment in websites as the second-highest priority for their digital marketing, with 55 percent expecting to spend more money in that area. “Websites are still the mainstay of having a digital presence and seen as essential in promoting your business online,” said Zaiger. Even smaller companies that might have felt they could not afford a fancy website in the past can now use drag-and-drop site builders such as Wix, Weebly and Squarespace to construct a website easily at little or no cost, Zaiger added. Reports of the death of email marketing have been greatly exaggerated. Though 15 percent of businesses in the survey expect to reduce the amount of money they spend on email marketing in the coming year, another 43 percent plan to increase their spending. A survey by the Direct Marketing Association in June 2016 found that email marketing had a median return on investment of 122 percent, four times higher than other channels studied, including social media, direct mail and paid search. Email marketing and websites may seem old school compared to social media platforms, but their effectiveness remains formidable. “Websites and email marketing are the highest-impact channels for the resources invested,” said Cook. A common thread links social media, websites and email marketing – the three digital marketing channels where businesses direct the most investment. Social media works well with websites. A well-crafted social media campaign on Twitter or Instagram engages potential customers and creates a dialogue that can drive traffic to a company’s website. Companies can follow up on email with addresses collected from visitors. 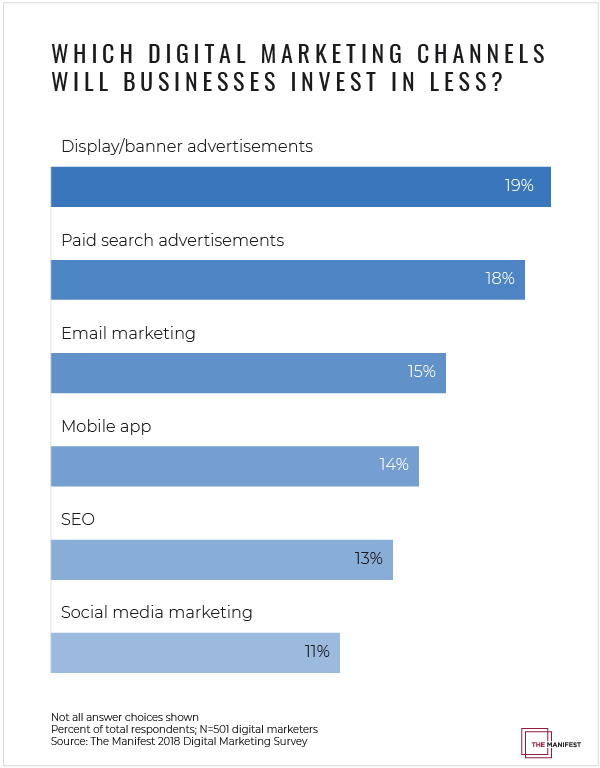 By contrast, businesses expect to reduce their investment in display/banner advertisements and paid search advertisements in 2019, with planned reductions of 19 percent for the former and 18 percent for the latter, according to survey respondents. These channels can be expensive and difficult to control, and the results are difficult to track. But Greenberg cautioned that companies should not automatically assume that online advertisements are not worthwhile. On popular websites such as Amazon, ads can reach an enormous audience of potential customers. Looking for new ideas and perspectives in their digital marketing efforts, many companies expect to rely more on outsourcing in the coming year. Most companies – 69 percent – presently use in-house staff to meet at least some of their needs, while 50 percent use a digital marketing agency and 32 percent use freelancers or consultants. But nearly one-third of businesses (32 percent) that do not currently use a digital marketing agency and/or a freelancer/consultant plan to outsource at least a portion of their digital marketing work in the next year. Almost all companies plan to increase their investment in at least one digital marketing channel in the next year, the Manifest survey shows. Social media, with its potential for dramatically increasing a company’s online profile, is the top priority for increased investment in digital marketing channels. Websites remain a mainstay for many companies and are expected to attract the second-highest increase in investment. Email remains an effective means of marketing, and while some businesses are reducing their use of the channel, more plan to increase their email marketing budgets. Although some businesses plan to invest less in display/banner advertising and paid search advertisements, they remain an effective digital marketing channel for many B2C companies. Nearly one-third of businesses that do not presently use a digital marketing agency or other outside consultation plan to do so in the coming year, seeking new ideas to compete in an ever-changing digital marketing world.